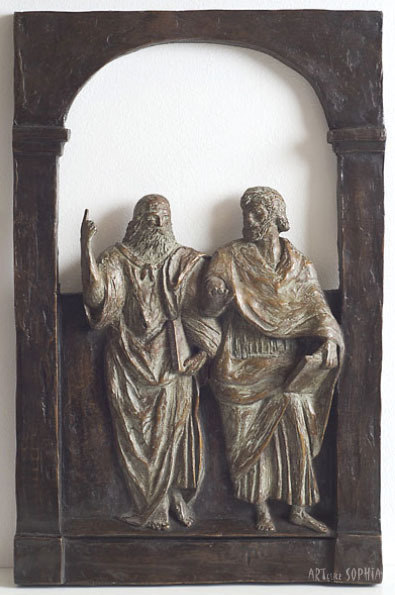 Plato and Aristoteles, the 2 most known Greek philosophers. This relief is made after the centre part of the famous Rafaël fresco “the School of Athens”. Rafaël painted it in 1510/1511 for the library of pope Julius II. Plato points his finger upwards to the brainchild world while holding in his other hand the book TIMAEUS. Aristoteles gestures downwards to the earth which we can see and from which we can learn. He holds the book ETHICA in his hand, in which he poses that we can increase our happiness by being intellectually active. Also the POLITICA writings are from his hand.